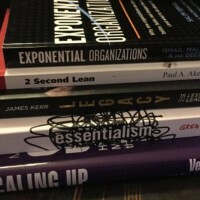 As more business and thought leaders are highlighting the importance of reading more it struck me as a good time to reflect on the business books that I had read in 2015 and highlight those that have had the biggest impact on my thinking or helped facilitate the learning of others. 2015 was the year that Mark Zuckerberg from Facebook set a goal to read a newbook every two weeks. Mark declares that reading has been both intellectually fulfilling and has given him more perspective on a number of topics — from science to religion, from poverty to prosperity, from health to energy to social justice, from political philosophy to foreign policy, and from history to futuristic fiction. Bill Gates has his ” Think Week” each year which allows him to not only recharge his batteries but to read the books and articles that will help him to recharge his thinking. In the past five years the business world has seen the birth of a new breed of company – The Exponential Organisation – that has revolutionised how a company can accelerate its growth by using technology. 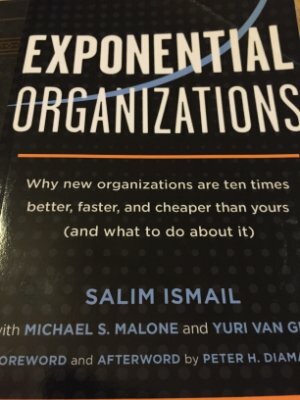 An ExO can eliminate the incremental, linear way traditional companies get bigger, leveraging assets like community, big data, algorithms, and new technology into achieving performance benchmarks ten time betters than its peers. Is your company organised for something like that? Can your top down, hierarchical, linear, large, financial outcome driven organisation, asset based, with unengaged staff with a five year strategic plan, cope with this? The answer is a resounding “no”. “Exponential organisations” looks at how organisations should be organised if they are to survive the oncoming tsunami of change or what they call the asteroid of digitised information. Helping you to avoid becoming the dinosaur that will be extinct. Because disruption will be the new norm. Everywhere! You can either do it yourself, or someone will do it for you. The outsider has all the advantage. And forget about the experts. They don’t understand exponential either (neither do economists). How long does it take to get your new product to market? Apparently the average is about a year. Quirky can do it 29 days. Airbnb owns no physical assets and is worth $10 billion, which is bigger than Hyatt Hotels. Hyatt Hotels has 45,000 staff and 549 hotels. Airbnb has 1,300 staff, 500,000 listings in 33,000 cities. And it is only 6 years old. As the author says, ‘ Essentialism is not a way of doing one more thing; it is a different way of doing everything’. Many of us are ‘majors in minor things’, that is, we do too many things, most of which are non-essential. Given that we have limited time, the habit of doing unnecessary things affect the quality of the things we really need to do. That is the essence of essentialism – precision. Doing what needs to be done and no more. McKeown rehashes many of the ideas that R Covey has advocated in his ‘Seven Habits of Highly Effective People’, but he has done it in a very efficient way, and the success of his effort lies in the fact that the reader can finish his book in one evening and feeling refreshed with bright ideas and the inspiration to put them into practice right away. Following the brilliant achievement by the All Blacks in winning back to back Rugby World Cups, this beautifully written book is a unique and inspiring handbook for leaders in all fields and asks: How do the best in the world stay the best in the world? What are the secrets of sustained success? How do you maintain exceptional standards? How do you develop ownership,leadership and accountability into your team? How do you turn vision into action, purpose into practice and pressure into results? And how do you leave your Jersey in a different place? For me Legacy is a great book for anyone looking to introduce a culture of winning either in sport or in business. Very well written and with some very practical insights that you can incorporate across your business with immediate effect. much of which is not driven by the Management team but through the “Unused Employee Genius” that rests within all of your team members. I have been using the book with many of the Manufacturing and Engineering companies that I consult with and it has had a massive impact on their efficiency and more importantly profitability and all of the key learnings are backed up by Paul’s videos which you can watch on the Fast Cap YouTube site. Scaling Up is a very powerful and practical guide for any entrepreneur and Mid Market company who are seeking to move from the Start Up phase to the growth phase. Well written with attention given to the Four priorities any Mid Market organisation needs to focus on: Strategy, People, Cash and Execution. The biggest benefit are the highly practical tools that support the four priorities including how to complete the One Page Strategic plan accompanied by excellent case studies. Verne Harnish is a great aggregator of taking insight and learning from some of the top authors for helping high growth companies achieve their growth ambitions. The book is full of insights and practical guidance that can be used as a Text book alongside the Gazelles tools to help master the key areas of Strategy, People, Cash and Execution. I am looking forward to reading more great business books through 2016 and at the same time would love to know your top books from last year. Please feel free to enter into the comments box below. Neale Lewis is a Business Growth Expert and executive business coach specialising in helping ambitious companies achieve their growth ambitions.